The new European norm came into effect in October 2004, concerns the storage of flammable products in laboratories. It also only concerns the safety cabinets which internal volume is equivalent or less than 1m3. In case of fire, the safety cabinet shall assure that, for at least 15 minutes, the contents of the cabinet do not contribute to any additional risks or spread of fire. or at least, 110% of the volume of the largest single container, whichever is the greater. The doors of the cabinet must be fully self-closing from any position. The side and back walls must be of the same thickness and comparable construction. Requirements are given in respect of the construction of the cabinet and its capacity to resist fire conditions from the outside (Fire test given in ISO 834-1 and EN 1363-1). The appropriate warning sign for “Caution: risk of fire” and the appropriate prohibition sign for “Fire: Open light and smoking” according to ISO 3864 (all parts). The fire capability, specified in minutes, e.g. Type 15, 30, 60 or 90. Advice that the door(s) must remain closed when not in use. Name and/or trademark of the manufacturer. Maximum volume of a single container, in relation with the sump capacity, to be stored in the cabinet. All cabinets described in this brochure have been tested and approved according to EN 14470-1 (04/2004). The tests have been carried out by an independent European laboratory. 793 model after fire resistance of 105 minutes. 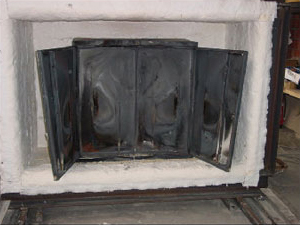 The internal part of the cabinet remained completely fireproof during the whole test. 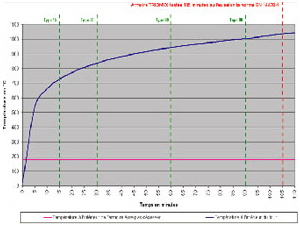 ISO 834-1 fire test curve. *Flash Point: Lowest temperature at which, in test conditions, a liquid could emit some flammable gases able to burn without ignition source.